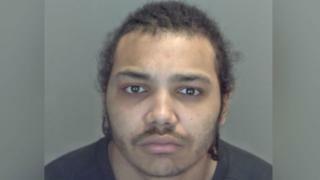 An inmate who attacked two prison officers at HMP Norwich has been sent to a psychiatric hospital. Cairo Adams, 23, originally from March in Cambridgeshire, denied two counts of wounding with intent to do grievous bodily harm, but was found guilty by an Old Bailey jury. On Friday he was detained under the Mental Health Act. At his trial earlier this year he was cleared of two counts of attempted murder.